When taxes on cheap periodicals were withdrawn in the 1840s, Herbert Ingram published this attractive, illustrated, weekly magazine. It was aimed at the working classes, who would not have been able to afford a daily newspaper. The first 16-page edition was published on 14 May 1842, cost sixpence, and included 32 woodcut illustrations. This first edition sold about 26,000 copies, making it an immediate success. 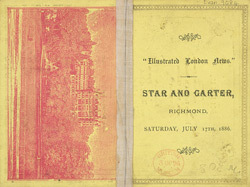 The Illustrated London News' pictorial coverage and reporting of special events was the key to the magazine's success. It focussed on promoting social reform and campaigned for the introduction of various Poor Laws, Factory Acts and change in working conditions for miners.